Just north of my home a busy duel carriageway cuts through a group of Bronze Age burial mounds. The small grassy heaps sit on each side of this frenetic highway, so close to the traffic that the tussocky edge of one of these structures seems to be shaved by the road surface. This uncomfortable confluence of grass and tarmac points to daily negotiations between the ancient and the modern, and starts to reveal assumptions about what we feel does and does not belong in the countryside. The fervent activities of road protestors and their often violent clashes with the authorities are testament to place of major roads within the cultural consciousness as other to the rural landscape, and often in direct opposition to it – as its destroyer. However debates around motorway design in England in the 1950s and 60s reveal that these roads were originally conceived as belonging to a landscape of rural modernity. 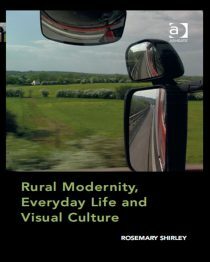 This paper explores how this perhaps surprising conflation of the countryside with speed has been played out in the visual and textual rhetorics of Country Life magazine, the Shell County Guides and Shell’s advertising campaigns. Country Life was founded in 1897 and continues to be produced in the UK as a weekly glossy magazine aimed at a wealthy countryside elite. It has become a stalwart publication in terms of representing an arguably idealised image of rural England and contributing to a notional form of national identity. It is unsettling then to find so much of the magazine given over to the discussion and advertising of cars. This content gives the publication an unexpected texture in which narratives and aesthetics of speed sit next to features on standing stones and hibernating dormice, communicating a multivalent collage of speed and stillness, the ancient and modern. The Shell County Guides were a long running series (1933 – 1985) of guidebooks to the counties of England sponsored by the Shell Oil company. Originally designed to appeal to a market of middle class motor tourists, they were slim volumes to be read while on the road and stashed in the glove compartment. At this time the company’s advertising posters were also designed to be seen at speed, as their primary canvas was the sides of the lorries used to transport Shell products around the country. Analysis of the avant-garde imagery and montage techniques used, in contrast to the preservationist stance adopted by the guide’s editors and the company itself, reveals an ideological alignment of nature and technology together with an unexpected reclamation of speed as a characteristic of the English landscape.